Ascentium Capital offers the ideal finance solutions for capital investments that will help grow your business. Seize more opportunities with our commercial and industrial equipment financing. We know that the right machines, tools and technology are essential for your business to deliver quality work completed on time and on budget. 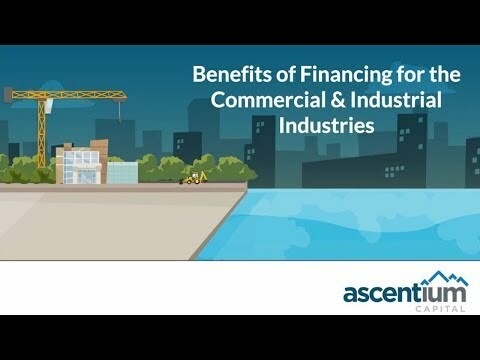 Ascentium Capital’s commercial and industrial equipment leasing and finance programs help companies acquire the equipment, technology, and software they need to get the job done. Our financing programs benefit manufacturers, distributors, and direct to businesses and contractors nationwide. Fast and flexible, Ascentium Capital's equipment financing programs offer deferred payments and 100% financing: ability to include shipping, tax and other expenses for your commercial equipment. By including these costs into affordable monthly payments, your new equipment can begin driving revenue immediately. In addition, we can approve your financing request in just a few hours. We’ll help you develop a finance program that meets your cash flow needs. We also work with distributors, manufacturers, and other business partners to help their customers get financed.